The On-Counter Touch & Go� Blending Station� offers six different programs allowing you to blend any kind of drink consistently at the touch of a button. � PRE-PROGRAMMED! 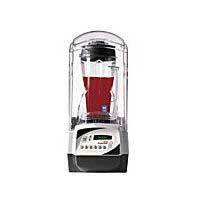 Six different mixing programs allow you to blend any kind of drink consistently. � QUIET! Built in sound abatement features reduce the noise levels lower than the level of normal conversation. � PERFECT DRINKS! Buttons are programmed for accurate speed and timing for perfectly blended, homogenized drinks without chunks of ice. � VERSATILE! Manual blending option with low or high pulse variability. � STATE-OF-THE-ART-ELECTRONICS! Digital display shows seconds remaining and is easy to read from any angle. � AUTOMATIC! Display feature records the number of drinks prepared and automatically remembers the last blending speed. � TIME SAVER! Drinks are perfectly blended while servers do other tasks. Warranty: 3 year warranty against defects in parts and workmanship which includes a 1 year service contract.